I spent a long time trying to figure out what I was going to say on this blog. I mean, Sam has been kind enough to let me use this space as part of my ‘blog tour’, and I wanted to do something a little more meaningful than just drop in a plug for my new book and throw a quick wave over my shoulder as I walked off into the distance. In mid November I read a blog post by Marsha Moore on Fantasy Faction. It was the second part of a longer piece that was breaking down and defining subgroups of fantasy genres that Marsha referred to as ‘Low Fantasy’. There were seven categories and three sub categories just in that article, and whilst I’m in no way suggesting Marsha was doing anything wrong, I must admit it shocked me. Look, I know humans generally have a need to put things into neat boxes, but when I was in my twenties we made do with SF, Fantasy and Horror and that was good enough for anybody. More seriously, it worries me a little that things are getting so fined-down now. OK, many people wont really give a fig if Harry Dresden is or isn’t in the same sub-sub-genre as Simon R Green’s ‘Nightside’ stories, but I hate the thought of someone thinking they only liked a certain sub-sub-genre, and subsequently missing out on a wealth of other material. It’s like only eating one specific type of pizza. It doesn’t just affect readers. It matters to writers too. Publishers want the writer to be a ‘brand’. 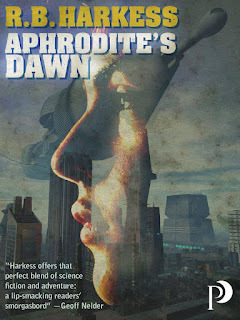 ‘RB Harkess, Young Adult author’ is much more definitive than ‘Joe Bloggs, who writes SF, Fantasy, a bit of horror and some urban fantasy’. You can see their point, and it makes it easier for the bookstores to know which shelf to put you on. Problem is, I wouldn’t want to just be writing one type of story for my whole career. That’s one of the reasons I like writing for the Young Adult market; the lines are a little more blurred, the fences between the sub-genres a little lower. 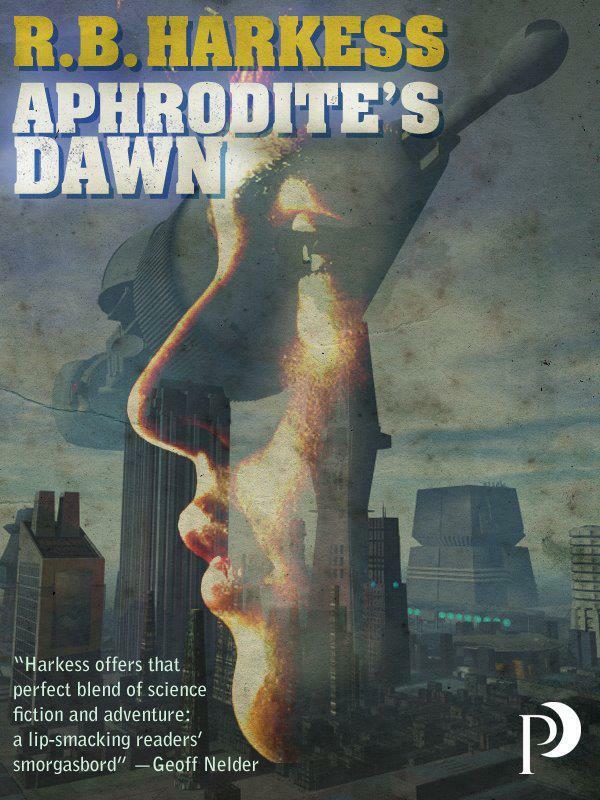 My first story - just published as an e-Book by Proxima and available from Amazon - is called “Aphrodite’s Dawn” and is a science fiction adventure. The story I am working on at the moment is a blend of Urban Fantasy and Steampunk. I’m expecting both to be published under the same name. In the ‘adult’ market I probably wouldn’t be able to, certainly not if I’d made a name in one genre or the other. So what’s my point – apart from plugging my wonderful new novel? I suppose, like Canute is supposed to have tried to turn the tide, I may be trying to argue against human nature, but I’m wondering if its time we stopped trying to slice things ever finer, subdividing ad absurdium. Or, to put it another way, perhaps I’m just suggesting we try to think outside the box. Never having been to an SFX Weekender before, I arrived at the venue at around 2.30pm on Thursday 2nd February with a little anticipation. I live in North Wales and so the Pontins wasn't that far for me to go and I'd arranged to meet my publisher and my friends from the Victorian Steampunk Society there. My first impression of the venue was that it was far nicer inside than the somewhat stark and bleak holiday camp exterior suggested. The large stage area was ideal for the main timetabled events, as was the screening area that hosted most of the panels. It was very dark in the dealer's room (or Bartertown as it was called) and this was an immediate concern for all of the dealers who were setting up. There was a lovely young lady helping with this called Terrie, who did her best to sort out as many of the problems as possible. That night I had a small soiree back at my house and it was great to see some friends I hadn't seen for a while. Roy Gray, Rob and Debbie Harkess, Lady Elsie, Ian Crichton, Major Tinker and my publisher Terry Martin. We didn't party too late though as we all had to be up early the next day. On Friday we arrived early but the action had already begun. The dealer's room was buzzing. I wasn't technically doing anything until 12 midday when I was programmed to sign at the Forbidden Planet stand but I wanted to be at our own table anyway. By lunchtime we had sold five full sets of my Vampire Gene Series of novels and I headed over to the Forbidden Planet table ready to do my signing. It was great fun over there and I had some time to chat with the lovely Jon Harrison, putting the world to rights about publishing and signings and selling books. At 1pm, a chap called Steve Shooter from Leeds Indie Radio arrived to interview me. The interview went well and Steve is great fun. In the middle of the recording Lady Elsie from the Victorian Steampunk Society brought me some lunch - fish and chips -and I happily munched my way through them during some of the recording as I was starving! After a hellish journey from London (there was a serious derailment which effectively cut off Euston Station from the rest of the UK) author Raven Dane reached Prestatyn and Pontins. She found her way to our table in Bartertown, and Lady Elsie and I fetched her a drink from the chaos that was the restaurant and within minutes she was selling her own books. There was a fantastic and positive vibe all weekend in Bartertown and it had been there from the Thursday onwards. People were having a great time, us included. It was fun to see the professional entertainers on their stilts, sporting costumes that were combinations of Alien and Transformers (I think!) along with various other guises of Steampunk angels and corsetted dancers. At 5pm I was on the What is Steampunk? panel. Which I felt went very well. The discussion was moderated by lovely Jonathan Green, author of Pax Britannia. Panellists were Stephen Hunt, Raven Dane, Me, Lady Elsie, Ian Crichton, Lavie Tidhar and the wonderfully fun Robert Rankin. The discussion ranged from literature to fashion in its exploration of what Steampunk is and can be. The panellists even discussed the ethos of the current Steampunk movement and the fact that Jules Verne, by today's standards, could be considered Steampunk (he certainly was innovative for his time!). After us, David J Howe (my partner, lover and best friend) was on the How to Get Published Panel. Moderated by Guy Haley, this panel also included Simon Spanton (Gollancz), Anne Clarke (Orbit) and newly published writer Anne Lyle. Straight after David's panel, Bartertown was sealed off for the evening. By then we had met up with three old friends of David's: Gordon Roxburgh, Dominic May and Tony Jordan. The three of them joined Raven, Lady Elsie, Ian Crichton, David and I and we went off to our favourite local Indian Restaurant - Rozi's - for a fantastic meal. Saturday came around very quickly. This was an interesting day as it didn't seem to be as busy in the dealer's room as Friday had been. I started the day with a panel at 11am What is Urban Fantasy? Moderated by Mark Charan Newton, the panellists were Benedict Jacka, Stacia Kane, Ben Aaronovitch, Paul Cornell and myself. Quite an impressive line-up I thought! This panel discussed what each of our perceptions of what Urban Fantasy was and it was a lot of fun. Following the panel I got back to the table to find the queue for the 12 midday signing had already begun and I spent the next hour signing copies of The Vampire Gene series and selling Zombies in New York and Other Bloody Jottings. By about 2pm we had completely sold out of Zombies, David's own collection Talespinning and Raven Dane's Cyrus Darian and the Technomicon. The rest of the day went by in something of a blur because I was constantly being asked to sign books and photographs and chatted to many, many people. After the panel, I returned to my table to find yet more people waiting for signatures. Which was very cool! A bit later, wanting to get out of the crowd and get a drink, David and I headed to the green room. Brian Blessed was sitting there on the sofa and so I introduced myself to him as he has recently just joined twitter and was following me and all of the other guests that were on the line-up list for the convention. Brian launched into a long story about his trials and tribulations of learning to use technology. He is such a character. Because we had sold out of everything we had brought, aside from copies of Telos' new guide to the TV show Supernatural, we decided to pack up and go back home at 6pm to get ready for the SFX Awards ceremony later that evening. We had a quick snack, got changed and arrived back around 7.30pm. By 7.45pm David and I had wine (two enormous pint glasses - the wine was cheaper to buy by the bottle, but they wouldn't let you take the bottle with you!) and were sitting near the front of the main stage area waiting for the evening to start. This was one of the funniest and most enjoyable award ceremonies I've ever been to. Made so, without doubt, by the marvellous Robert Rankin and his gorgeous wife Raygun. The evening opened with some of the lovely girls who had been on stilts all weekend doing a fantastic, upbeat dance number. Then Robert and Raygun were escorted through the audience by Darth Vader and his evil Storm Troopers, some of whom were covered in red bloodstains so had obviously been up to no good before the evening started. Robert was wearing a stunning Emperic Kimono and Raygun, sadly, had to carry his train. It was a magnificent entrance and not having been to the SFX Weekender before I didn't realise what a brilliant double act Robert and Raygun are. The awards began, much humour ensued. To see the full results then click HERE. Some highlights of the video acceptances: Neil Gaiman - not only is he a genius but he also has a keen sense of humour. Is it me or does George RR Martin look like Captain Bird's Eye? Stan Lee - a legend. Complete legend. It was great to see Brian Aldiss receive the much deserved award for Outstanding Literary Contribution, and smashing that he was actually present. So many of the other winners could not attend for varying reasons. But that wasn't the end of it ... we then partied into the wee small hours. It was fabulous to spend some time again with producer and writer Phil Ford (Sarah Jane Adventures), who David and I know from the Doctor Who circuit and particularly from Gallifrey in Los Angeles. We'll be really sorry not to join him this year at Gallifrey. Phil had with him the truly adorable Anjli Mohindra, who plays Rani Chandra in Sarah Jane Adventures. We were kidnapped by them and taken to the pub ... forced to drink whisky! I was glad to spend time with another woman who enjoys whisky like I do! It was brilliant to catch up with Ken Macleod in the bar and have a chat with him. He is a really special, talented and very genuine person. We stumbled into our beds about 2am on Sunday morning - the party was still going strong when we left - and David, Lady Elsie and I all felt like we didn't want to leave, but we were by then absolutely exhausted. Thus ended our very positive experience of the SFX Weekender. And, being on my doorstep, I'll definitely be going again next year. See you there?